We take pride in being an independent festival. 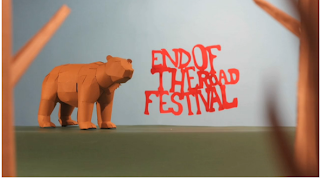 The idea with the End of the Road Festival was to organise an intimate festival with our favourite artists and to create a festival with a friendly and relaxed feel. Here is the header to the festival's website, I like the natural and vintage feel from abstract imagery of the peacock/ gramophone. This is the video of how the venue is put together, and all the work it takes, its sped up to show the passing of time. 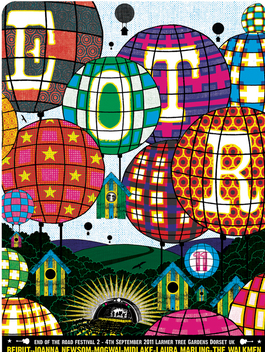 Here is a poster of the 2011 festival, i really like the balloon and lantern imagery, its colourful and eye catching. Simply one of the most magical, inspiring and intimate festivals of the summer."